North Myrtle Beach is an excellent beach vacation that offers endless stretches of powdery white sand and the crystal blue Atlantic Ocean. These are all but the beginning of what a truly great vacation in Myrtle Beach, South Carolina is all about. 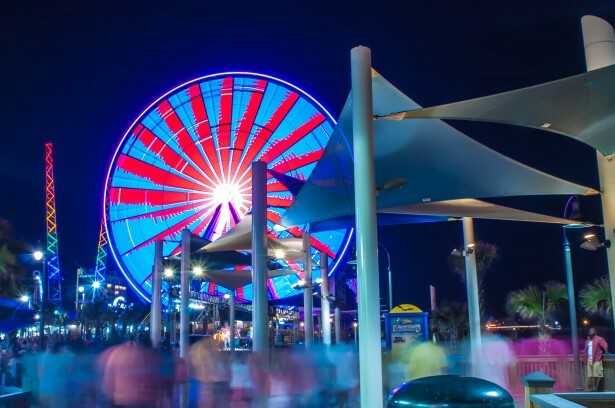 No matter if you are looking for a relaxing break from your daily routine or a vacation filled with activity, you'll find it all and then some in Myrtle Beach. There is something for your entire family here, including miniature golf, water parkers, fine dining, shopping, and a lot more. Golf lovers will find paradise in choosing from over 80 pro courses in the Myrtle Beach/North Myrtle Beach areas. When the sun goes down in Myrtle Beach, the fun doesn't stop. Several fine dining restaurants will tempt you with their delicious food. After you have dinner you can visit one of the many night clubs in Myrtle Beach that offers a dazzling array of entertainment that includes comedy, country music, rock 'n' roll, and of course the shag music that the beach is so very well known for. Tucked away from the hustle and bustle of life you'll find endless stretches of sandy beaches with the sounds and smells of the ocean. The salt water marshes here are full of shrimp, crab, oysters and even fish. No matter what you do, you can't help but relax as the ocean breeze caress the amazing landscape of North Myrtle Beach. Located just eight miles north of the Myrtle Beach area, North Myrtle Beach offers beaches that are less crowded, the pace is much slower, and fewer high rise hotels help to maintain a family oriented atmosphere. Here, you can take early morning strolls along the ocean and discover the endless treasures that nature has left for you and your family to enjoy.